Slide the pencil through the center hole of the record so the tip extends an inch or so (a few cm) beyond the other side. Angle the pencil so it is perpendicular to the record, then position the assembly so the record lies horizontal and the pencil shaft is vertical, with the tip of the pencil pointing down towards the table and the eraser end pointing up towards the ceiling. Wrap tape around the pencil just below the record, to ensure the pencil stays in place and can't slide back through the center hole. Test your assembly by twirling the pencil. The record should turn with it. If not, apply more tape as needed to ensure that the record and pencil do not move independently. Starting in one corner, roll the piece of paper diagonally to form a cone shape. Any shape is fine, but make sure one end of the cone (the tip) is closed. Use tape to keep the paper cone from unraveling. 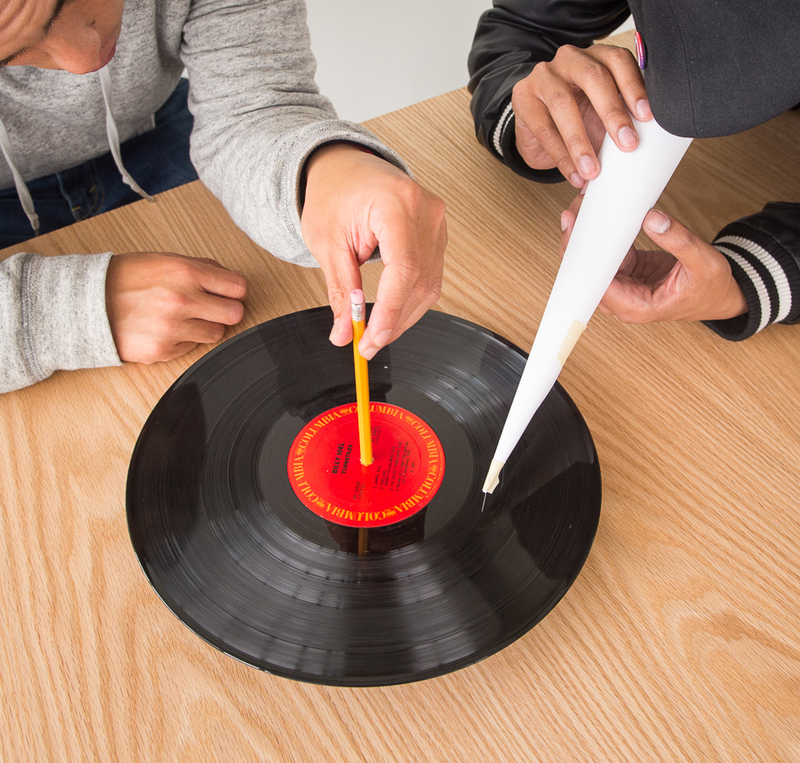 This activity requires two people: one to rotate the turntable and one to hold the needle arm and sound cone. To set up the turntable, hold the pencil-and-record assembly on a tabletop, point-side down, like a spinning top (the pencil will act as the axle of your spinning top). Make sure the record stays as horizontal as possible. Gently twirl the pencil, turning the record clockwise. See if you can spin the record at 33 1/3 revolutions per minute (RPM)—good luck! When you're ready, slowly lower the pin so that it rests in a groove of the spinning record. Gently hold just the top of the cone and let the weight of the cone be supported by the pin, allowing it to move with the motion of the spinning record. Listen to what comes out of the open end of the paper cone. It should be music to your ears! Your record has a groove in it. The groove is not smooth; rather, it has microscopic bumps and bends that correspond to the recorded music (click to enlarge image below). As the record turns, the tip of the pin travels within the spiraling groove, riding these bumps and bends and causing the pin—and therefore the paper cone—to vibrate up and down and side to side. The vibrations in the cone cause the air to vibrate. These vibrations then radiate out from the cone to your ear, which you hear as music, voices, or whatever has been recorded on the record. Try amplifying the volume of your pencil-pin-paper record player. For example, use different materials and try other cone- or horn-shaped designs—see how these affect the sound you get. 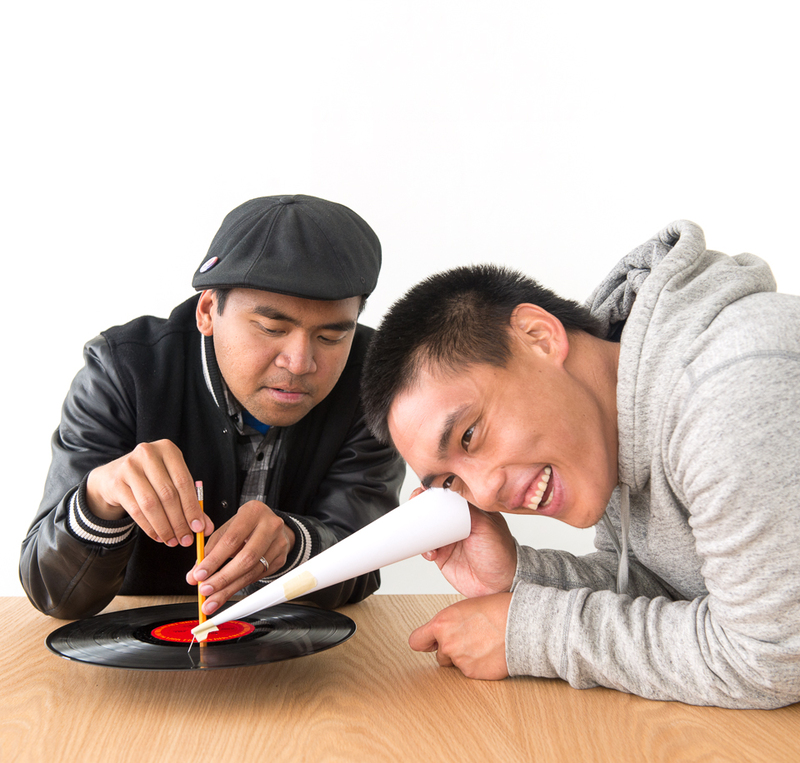 In this activity, you use your hands to turn the record. A real record player uses a turntable. Can you engineer a device or system that keeps the record turning at an appropriate and constant speed? Could you power it with only gravity? How about using water to turn your record? Inexpensive old records can be found at thrift shops, garage sales, and record stores. Have a variety of materials and records on hand for experimentation! Wrap a string around your head and pluck it to play music. Create graceful loops and spirals by drawing on a spinning disk.